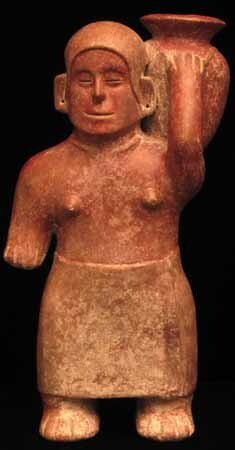 This finely detailed female Cargadora, or pot carrier, is wearing a long incised tunic characteristic of this type. A beautifully formed vessel rests upon her left shoulder. Her expression is one of good-natured serenity. Provenance: Acquired from a California Private Collection formed during the early 1970s. .